Com4 is one of few mobile-operators in Norway with their own mobile core-network and PLMN code. This means we have full control over our service, which is produced in a dedicated and and advanced infrastructure. Our platform is optimized for handling mobile data communication for M2M- and IoT- solutions. Our standard products are designed to cover the most basic needs and requirements of an M2M- and IoT- solution, but there are always some solutions that require individual customization. With full control over the infrastructure and leading technical competence in the field, Com4 is well suited to quickly and efficiently tailor the right solution for you. Web-Portal for management of SIMs and services, troubleshooting and reporting. We offer full mobile coverage in Norway (2G/3G/4G) plus seamless roaming in the EU and most other countries globally – everything delivered by a simple SIM. If an operator has no coverage in the area, or are having technical difficulties, you will automatically find an alternative network abroad. Com4 as one of few mobile operators, have their own mobile core network and PLMN code. It is in the core network the logic and functionality of the mobile network lies, and it is through full control over this advanced infrastructure we can offer a wide array of unique services which address the needs of machines. With leading technical competence in-house, we can quickly and efficiently offer custom solutions for solutions with special requirements. Redundant mobile platforms with duplex lines for power and fibre contribute to minimizing downtime, and is essential to suppliers of communication services. In addition to redundant datacentres, Com4 have invested in a secondary backup location in a secure mountain-hall. Therefore, the information is secure even if the primary location is exposed to external influences like water damage, fire or power outage. 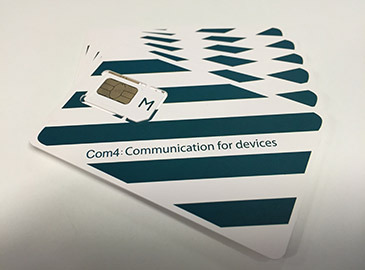 Com4 delivers a complete portfolio of SIM cards adapted to different use-cases for machines and the internet of things. New applications for M2M solutions keep popping up, and custom SIM cards is very important in securing a robust solution that can handle its operating environment. Today it is common to use traditional SIM cards, but we see an increased need for more custom SIM cards. In Com4’s portfolio you find SIM cards that can handle up to 105 degrees Celsius, shocks, vibrations and moisture. All Com4 SIMs comes as standard with a profile adapted to M2M. This means SIM cards without a PIN and with only data and SMS active in Norway. Barring services can be adapted with individual needs in the portal, and it is easy to enable voice or international roaming if needed. In addition to physically installable SIM cards, Com4 also delivers e-SIM. These are surface-mountable components which can be soldered onto the hardware to be used. The content on the component is uploaded with same content as a regular SIM card. Com4 cooperates with Gemalto, the worlds largest manufacturer of SIM cards, in the development of custom SIM cards for M2M services.